The way we work is changing, with more than four million people in the UK working from home. Your vision for your organisation might include offering your employees more flexibility to increase their wellbeing, or you might recognise that remote working can have benefits for your organisation. It can improve employee satisfaction, reduce staff turnover – particularly in areas where people have long commutes – and reduce absences, because people working from home get back to work more quickly after they have been sick. It’s also been shown to increase productivity, save money and help disabled workers and those with caring commitments access employment. People often want to work from home to improve their work/life balance, reduce stress and improve health and wellbeing. But it’s not for everyone and there are costs to wellbeing and resilience as well as benefits. In this blog we’ll explore how you can mitigate these costs and incorporate a flexible working culture into your vision for your organisation. Some of the potential problems for wellbeing include social isolation and loneliness, the effect on focus and productivity, working out how to manage performance, the effect on physical health and stress levels. We know from our research into the workplace of tomorrow that one of the downsides of remote working or for people working on different sites can be a lack of connection, the loss of a sense of community and a reduction in the quality of working relationships. Whether it’s supporting people to work from home, or dealing with employees on more than one site, it is vital that there are recognised channels for communication. It might be that you can set up instant messenger accounts or create virtual communities. Finding ways to monitor the wellbeing of those working with new technologies, in new situations, will help stop problems getting out of control. We need to balance the conflicting tendency of technology to connect and isolate. Employees can pick up the phone and speak to people rather than relying on email or instant messenger. Regular visits to the office can help to connect with colleagues and build relationships face-to-face. Employees who are focused are likely to be more productive at home than at work – there are fewer distractions than in an open plan office, for example. To maintain this focus, employees need to be connected to their organisation’s vision and values. So as an employer, if you can express these effectively, you will see the benefits as people come together behind guiding principles and a clear purpose. Working from home can help employees feel empowered, independent and self-directed. And once you’ve set up the systems to allow people to work across different sites, there are no excuses about finding the time and space to collaborate. Employees need to figure out how to keep focused when it’s quiet and there’s little structure to the day. Creating your own routines and rhythms can help, as well as developing leaderful behaviour yourself. Each of us is capable of affecting change if we take responsibility for our own actions. Managing employees who work from home is not without its challenges. Measuring effectiveness in terms of output, rather than hours worked, and setting clear goals and deadlines, can help. You can monitor how well these goals are met and give prompt feedback. It can be harder to spot decreased morale or to maintain staff development when you don’t see people face-to-face on a regular basis. Feedback sessions, visits to the main work site for meetings, and including people in social events, can all help. By developing leaderful behaviours and supporting people across all levels, you can create more trust. An environment in which it’s ok to make mistakes and ask for help encourages transparency and connection. Knowing each other better makes it easier to catch problems early. Although employees might be keen to give up a traffic jam-packed commute, replacing it with sitting on the sofa eating biscuits is not a recipe for physical health. Encourage healthy lifestyles and try to match perks for office-based staff. For example, if those at the main work site get free tea and coffee or fruit, make sure other sites are fitted with kitchens. You could think about offering gym memberships or vouchers for healthy snacks. As an employee, you can think about how you can fit exercise into your day. Taking regular breaks is essential for your physical and mental health. You could replace the time you used to spend commuting with a trip to the gym, or go for a walk round the block at lunchtime to clear your head and break creative deadlock. It’s been shown that being more in control of your environment means lower stress levels. Being able to set your own targets and decide how you will meet them can have a big impact. So it follows that being able to work in your own home (or a local café or co-working space, if you prefer to have other people around you) should reduce stress. This does require some self-knowledge and awareness of your own preferences. You need to know if you thrive on routine, how often you need to take breaks, and how much contact with others helps keep you focused. Setting clear times when you are working and not-working is essential to prevent the drift into checking emails at all times and never switching off. Have a clear time when you are going to turn off and stop work for the day. Some people find they do their best work when they dress for work, and shut themselves away in a home office. 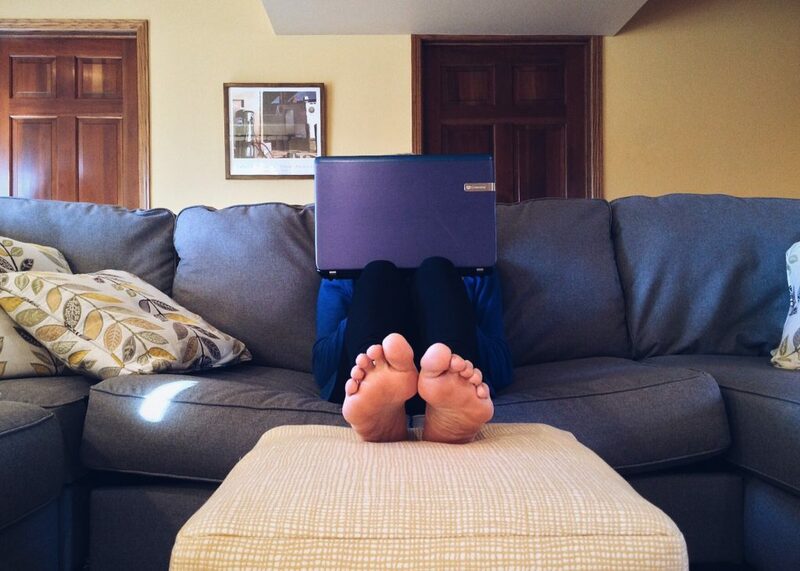 Others find that being able to sit in pyjamas on the sofa means they can relax and work in a stress-free environment. The beauty of being at home is you can choose which suits you best. To find out more about the Resilience and Wellbeing Network contact Lise Ribeiro by email or on 01937 541700.